When doctors told Robert Elam he’d have to get his leg cut off, he didn’t argue. He wasn’t even upset. He decided that if he was going to have one real leg for the rest of his life, he may as well make the other a peg leg and build a pirate ship to ride around in. Kids would get a kick out of it. Elam was first told he needed an amputation about three years ago he was found to be allergic to materials in his knee replacement, and subsequent ones. A doctor said his leg needed to be cut off four inches above the knee. A year went by with that doctor telling him he’d lose his leg. He’d later call the ship the “Cowboy Pirate.” It’s been through several paint jobs and renovations since Elam made it. 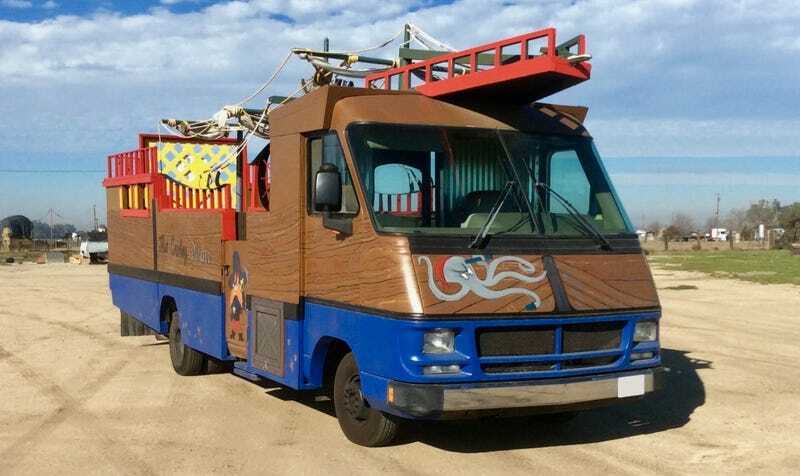 Elam, who’s retired and said he’s built 15 custom vehicles, planned to go to hospitals dressed as a pirate on a peg leg to hand out balloons to kids—coming and going in a pirate ship carved from a motorhome. Elam’s reaction to losing a leg shocked his friends, but it was just a normal thing to him. But Elam went to a different doctor later, who was adamant he wouldn’t lose his leg and found him another knee. He was allergic to that one, too. Elam said earlier this year the false knee that finally worked—at least temporarily—was coated in ceramic as a barrier between himself and the materials he’s allergic to. It didn’t work in the end, and Elam said he’ll be getting the leg amputated soon. Now, Elam will get what he wants. The plan is to make his hospital-visiting idea happen, so long as he feels well enough once he’s down a leg. Some of the images painted on the ship. The ship started as a 27-foot Fleetwood motorhome Elam and his wife lived in for more than a year. They bought a fifth-wheel camper, and Elam turned the motorhome into his newest toy. “I took everything out, cut it down to the shape I wanted,” said Elam, whose wife paints his projects. “Then, I built the ship for two or three hours at a time. Because Elam had to rest and take pain medication, he said he couldn’t focus on building the ship as much as usual. When he did get to work on it, it didn’t go quickly. Elam doesn’t like to take his time, or to keep things the same for long—he did major modifications to the ship three times within the first few months after he built it. Elam’s spent several thousand dollars on modifying the motorhome into a ship, not including the price of the motorhome itself. Cash flow is slower now that he’s retired, which slows down his build pace. He has to do a bit of work at a time when he gets retirement checks, and the same goes for actually driving his creations around. “When we get a check, we put gas in it,” Elam said. “It holds 80 gallons, [so when we get enough], we cruise around and go wherever we want. The ship doesn’t make Elam money, either, because he doesn’t want the hassle of renting rides. Insurance, liability and all of that—nah. But he always has passengers in the form of his friends’ kids. “Once the kids ride in it one time, they freak out,” Elam said. “I go buy those $3 pirate hats, and when the kids ride, I give them a hat. No matter how fun it is, Elam’s sure he’ll slow down with the vehicle builds someday, especially as he gets older. But for now, he plans for his next build to look like steam-engine train running in reverse. With the amputation coming up, Elam said he hopes he’s in good enough shape to make the train happen. If he isn’t, it’ll be really unlike him to keep the ship around. What Elam does next will depend “how long it takes to recover,” as will his life as a peg-legged pirate at hospitals. But regardless, his outlooks are about as optimistic as outlooks can get.